RIO GRANDE CITY — It will be four more years for Starr County Judge Eloy Vera who defeated challenger Letty Garza Galvan in the Democratic primary Tuesday. Vera received 7,197 votes to Garza Galvan’s 7,008 votes, according to unofficial final numbers, clearing the way to run unopposed in the November general election. Garza Galvan, a speech pathologist who also serves on the Roma school district’s board of trustees, delivered a close and hotly contested race. The road to primary day was a tumultuous one as the candidates didn’t shy away from openly criticizing each other. Among the candidates for the three big races in the county — which include the race for 229th District Court judge and state rep. for District 31 — the county judge hopefuls were the only ones who did not face each other during a debate held in early February, which Vera chose not to attend. In the county commissioners race for Precinct 2, Raul “Roy” Peña III defeated Clarissa Gonzalez to remain on the commissioners court with 2,734 votes to her 976 votes. 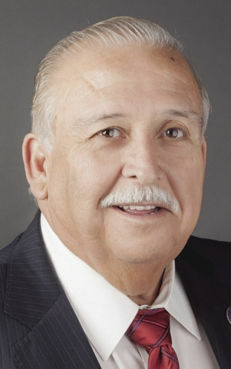 Peña was appointed to the commissioners court after his father, Raul “Roy” Peña Jr., died last year. In the Precinct 4 race, Ruben Saenz defeated Alvaro Peña to serve another term in office with 2,354 votes to Pena’s 1,376 votes. In the district clerk race, Orlando Velasquez defeated incumbent Eloy Garcia with 6,986 votes to 6,166. In the race for county clerk, which was up for grabs, Humberto “Bert” Gonzalez took 7,660 votes to Patricio Hernandez’s 5,180 votes. County Treasurer Fernando Peña was ousted by challenger Romeo Gonzalez, who received 7,502 votes to Peña’s 5,850 votes. Gonzalez will not have a Republican opponent in the November general election.